Several of Holy Trinity’s ministry groups will spend the weekend of December 16-17 engaging in activities together in preparation for the Feast of the Nativity. On Saturday morning, the men of the parish will have breakfast; in the afternoon, the Altar Society will decorate the church, and the Choir and the Church School will conduct rehearsals. On Sunday, after the Church School Christmas Play, the women of the parish will exchange cookies and recipes in Trinity House. For a full schedule of events, see the parish calendar. The Women’s Ministry will conduct an informational session after liturgy on Sunday September 17 at noon. Grab a coffee and a bite to eat, and come to the conference room in Trinity House. In addition to previewing this year’s study, we will brainstorm potent-ial activities that might be of spiritual benefit to us and the parish. Especially, what can we do to provide help and comfort to particular sub-groups of women: older women, young mothers, single parents, etc.? The goal is to not only leave the meeting having determined the best meeting times and dates for the study but also have a set of action plans for the new ideas and events. As for the study, we plan to spend the year examining The Theology of Illness by Jean-Claude Larchet, a small but dense text exploring how Orthodox Christians find healing despite living in a fallen and broken world, subject to all of the suffering and evil that comes upon us as a result of sin. The goal of the study is not to seek a single cure for what ails us but to learn to live with what besets us. Moreover, we want to do it in a way that opens ourselves to all types of healing, impacting not only our lives but also the lives of those around us. To allow as many women as possible to participate, we plan to meet in the daytime of one week, and then in the evening of the next week; with both sessions covering the same material. Finding the times that accommodate the most people is part of the September 17 meeting agenda. In addition to the biweekly study, a dedicated section of the parish website will be established where we can post supplemental materials and links. There will also be a forum where we can further discuss the text. Sessions will continue into the Spring and will conclude with a Saturday day retreat similar to last year. 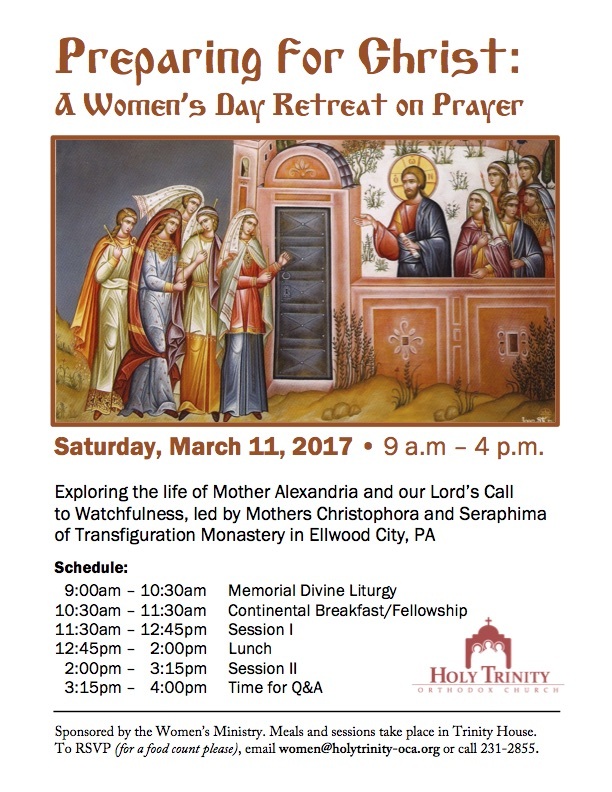 The abbess of the Orthodox Monastery of the Transfiguration in Ellwood City, Mother Christophora (Matychak) will lead women in a day retreat devoted to prayer, worship, fellowship, and mutual support from 9 a.m. to 4 p.m. on Saturday, March 11, 2017. Worship will bookend the retreat with the Memorial Divine Liturgy for the second Saturday of Lent in the morning (9 a.m.) and Great Vespers in the evening (6 p.m.). Services will take place at Holy Trinity Orthodox Church, 119 S. Sparks Street, State College, with sessions and meals taking place next door at the Trinity House Ministry Center, 123 S. Sparks Street. The retreat, entitled “Preparing for Christ,” will examine the life of Princess Ileana of Romania, who became Mother Alexandria and the founder of Transfiguration Monastery. Using the theme of prayer and watchfulness with the biblical book of Nehemiah and Holy Tuesday’s Parable of the Ten Bridesmaids as backdrops, Mother Christophora will offer two sessions of instruction with a group discussion after each one. A third session allowing participants an additional time for questions will conclude the day spent together. Mother Christophora will be joined by Mother Seraphima, née Sister Helene (Krenitsky), a Penn State graduate and former president of the Penn State Orthodox Christian Fellowship (Mechanical Engineering, ’05) who joined Transfiguration Monastery in 2009 and was recently tonsured to Little Schema by Archbishop Nathaniel, the monastery’s overseer, on December 31, 2016. The retreat is offered to all area women free of charge and is sponsored by Holy Trinity’s Women’s Ministry. Attendance at the ministry’s Tuesday night bible studies on Nehemiah this Spring will be a benefit to participants, but is not required; and all women are welcome to attend one or all of the sessions and meals. (Registration is required, however, so an appropriate amount of food can be prepared.) Please email women@holytrinity-oca.org or call 814-231-2855 to learn more or to RSVP. Women’s Night Out is this Thursday! On Thursday, October 6 from 6:00 to 7:30 p.m., the women of the church will be heading to The Greek, 102 E. Clinton Ave., for their annual “Women’s Night Out.” The Women’s Ministry will need to give the restaurant a head count on Wednesday evening so RSVPs are required. To RSVP, call Susan Pettengill at 231-1252 or email women@holytrinity-oca.org no later than Wednesday afternoon, October 5. Ladies, we will see you at The Greek! The Women’s Ministry is conducting a book study beginning this Tuesday and continuing on alternating Tuesdays through November 22. This year the group will read Royal Monastic Princess Ilenea: The Story of Mother Alexandra. The study will be held in the Conference Room at Trinity House from 10 a.m. to 11:30 a.m. The first class will examine the book’s first section (through page 33). Books can be picked up today or tomorrow at Trinity House for $12. For more information, contact women@holytrinity-oca.org. Beginning in Fall 2015, adults in Centre County will have additional opportunities to learn more about the Orthodox Christian Faith. To better serve you, Holy Trinity has scheduled a variety of study groups for you to choose from. For a full calendar of Holy Trinity services and events, click here. This bimonthy class led by Fr. John Reeves is intended for anyone who wishes to learn more about the Orthodox Faith. It begins Sunday, September 20 and meets in the Parish Hall (119 S. Sparks St., lower level) on the first and third Sundays thereafter for six sessions. For more information, please email info@holytrinity-oca.org. Topics covered include the history of salvation, the doctrine of the early Church, Christian worship in the First Century, and spirituality (“What must I do to be saved?”). The Adult Study Group is also led by Fr. John and meets every Tuesday at 7 p.m. throughout Fall 2015. The 14-week series begins September 8 and concludes December 8 (there will be no class on Election Day, November 3). The study is open to all adults. For more information, email info@holytrinity-oca.org. The Women’s Book Study kicks off on Thursday, September 10, at the rectory (562 Lanceshire Ln., in Park Forest) at 10 a.m. The group will study the life of Mother Maria Skobtsova and read Pearl of Great Price by Sergei Hackel. The books can be purchased in the bookstore for $12. Matushka Linda Reeves will lead a discussion on Chapters 1 and 2 at the first meeting. For more information, email women@holytrnity-oca.org. Penn State students are invited to attend the weekly Orthodox Christian Fellowship (OCF) meeting on campus, which features a complimentary dinner and student-led spiritual reflection moderated by its spiritual advisor or chaplain. These informal meals and time for fellowship are open to all Penn State students, faculty, and staff, especially those interested in learning more about the ancient Christian Faith as practiced and believed by the apostles. To learn more, contact us at orthodox@psu.edu. To RSVP for dinner, visit our Facebook event page. Holy Trinity’s annual St. Nicholas Gift Tree to assist struggling families in our area will be displayed in the Narthex beginning December 1. Celebrate St. Nicholas’ love for Christ with Vespers and Liturgy on December 5 and 6 (with a special surprise for the children). Daily Evening Worship with Confessions begin on December 20 to prepare for the Feast (see calendar for start times). 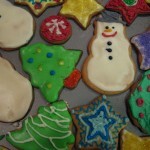 Women will exchange cookies and fellowship over a Lenten meal on December 20 at 11:30 a.m. The Altar Society will decorate Holy Trinity on December 21 at 10 a.m. All are welcome. A traditional Holy Supper for all will precede the Nativity Eve Vigil. The meal begins at 4:30 p.m. The Synaxis Liturgy (December 26 at 10 a.m.) will continue our celebration of Christ’s birth. The Oleyniks (125 Wildernest, Port Matilda) will host an open house on Dec. 29 from 2-5 p.m.
For more information on any of these events, please email info@holytrinity-oca.org. 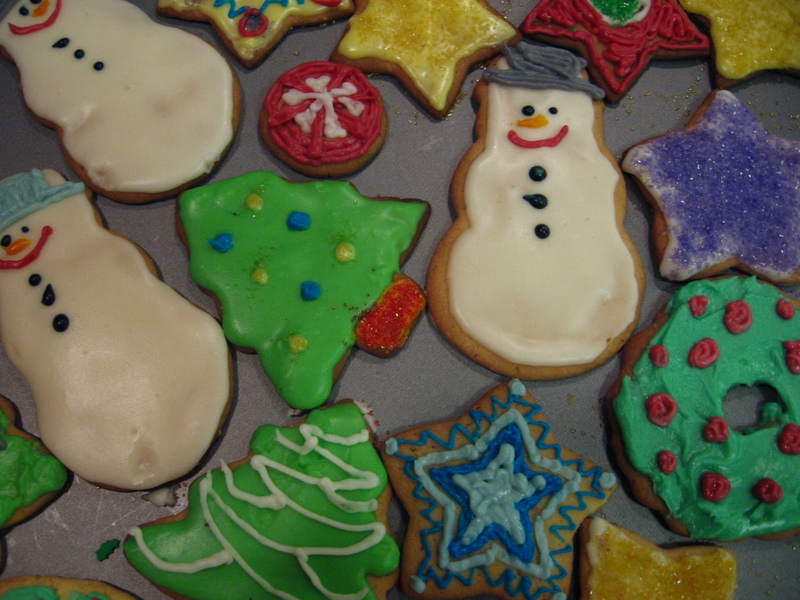 The Women’s Ministry will host a “Cookie Exchange” on Friday, December 21 at 11:30 a.m. To participate, bring a minimum of three dozen homemade holiday cookies and the recipe. A light lenten lunch will be provided and a portion of the baked proceeds will be donated to Housing Transitions. See the sign up sheet in the Parish Hall to participate—the more that do, the greater the variety of cookies/recipes to take home and share.